2011 has been a rough year for some of us, but it has been good for premium brands. Audi recruited 3,500 new employees in 2011. The manufacturer had never hired so many people in one single year. That expansion will keep on going next year, with Audi planning to hire 1,200 new people in 2012. To get along, Audi has budgeted a 13 billion euros ($16.87 billion) investment for upgrading and enlarging production facilities, with 10.5 billion going to the development of new models and new technologies, such as hybrid or electric. Then 2012 will be a milestone year for the brand because this will be the year where it launches its first production electric car. 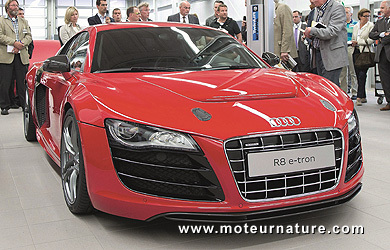 The R8 e-tron will be low volume, but everybody expects it to be a star of next year’s Paris show, in October. In my mind, the Audi R8 e-tron will very probably be the best electric car ever built. Many people are talking about the Tesla model S, and it will likely have a great drivetrain, but that’s only one part of the car. When it comes to build quality, interior materials, Audi isn’t playing second. The trim inside big Audis is often considered as the industry benchmark. The Audi R8 e-tron will be very expensive, no doubt about that, but you can be sure it will look and feel expensive in every detail. Wow, this EV model is super cool. No doubt its a direct competition to Tesla Roadster. EV Cars are the future but very expensive for now, but someday electric eehicles eventually go mainstream.